Disclosure: I participated in an Influencer Activation on behalf of Mom Central Consulting for the Staten Island Yankees. I received tickets for the game as well as food vouchers to facilitate my review and a promotional item to thank me for my participation. Despite being compensated, all opinions are mine and honest. 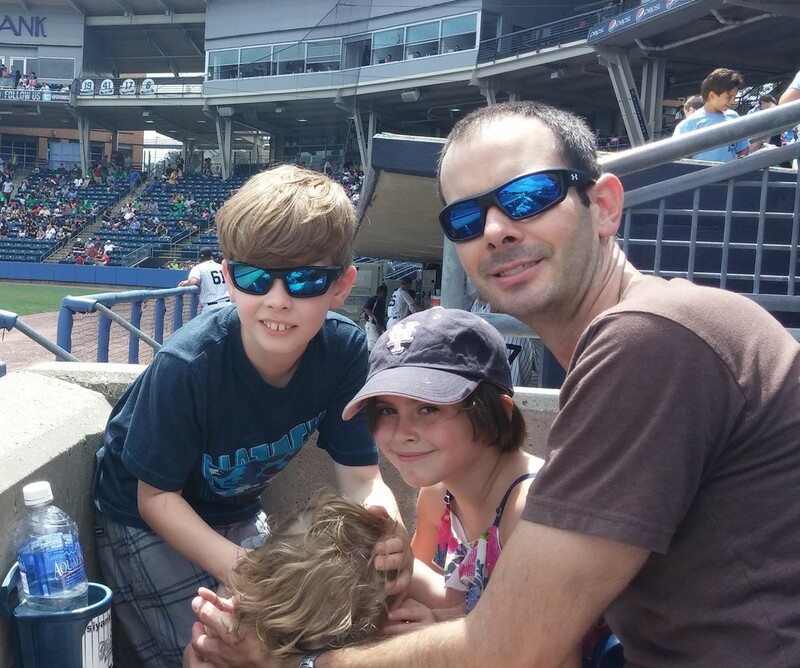 Jason Greene and two of his children take in a Staten Island Yankees game last season. My family has been on a mission the past few years to visit as many Major League and Minor League ballparks as we can. And now attending a Staten Island Yankee game is on my list of favorite things to do in New York. The ballpark sits just a three-minute walk from the Staten Island Ferry terminal and the view from the ballpark is fantastic. Beyond the outfield wall, you can see the boats and the ferries cruise along the water. Lady Liberty stands tall past the center field wall and in front of the Manhattan skyline. Tourists can accomplish three things at once there – a baseball game, seeing the Statue of Liberty, and getting a great shot of the Manhattan skyline. But the main reason to go to the ballpark is to cheer on the Staten Island Yankees. There is something special about watching a Minor League baseball game. It takes one back to a more innocent time and there is always the watching the next big thing while he’s an 18-year-old rookie. Like most ballparks, the food consists of favorites like hotdogs, pizza and sandwiches. The prices are pretty standard compared to most other minor league ballparks in the Metro New York area. I drove so I didn’t even bother checking out the beer selection. Sorry, I don’t have any info for you there. Getting to the game is easy. You can either take the Staten Island Ferry, which lets you off right by the stadium or you drive. Driving is easy, but the costs rack up between the bridge tolls and parking, so unless you can’t budget the time for public transportation, take the free Staten Island Ferry. The Staten Island Ferry is the best bargain in New York City and is worth the trip itself. Would I recommend a Staten Island Yankees game? Look at the smile on this face and you’ll have your answer.